I had wanted to run in the morning, but what sounded like someone playing basketball at midnight kept me awake. Just one more night and I’d be back to the normal routine, and getting in what training I could before heading to New Zealand at the end of the month. Breakfast at this hotel was not as good as the previous - so I had granola and fruit. They had no apple juice, and no tea. If they’d had either then that’d have been a massive improvement. It was still cold out - the snow covered cars were still covered, but the paths were clear. Yet still it felt warmer than Geneva had when we left there. We started by heading south to the old botanical gardens. These are part of the Zürich University, which was open despite the adjacent museum being closed for the holidays. 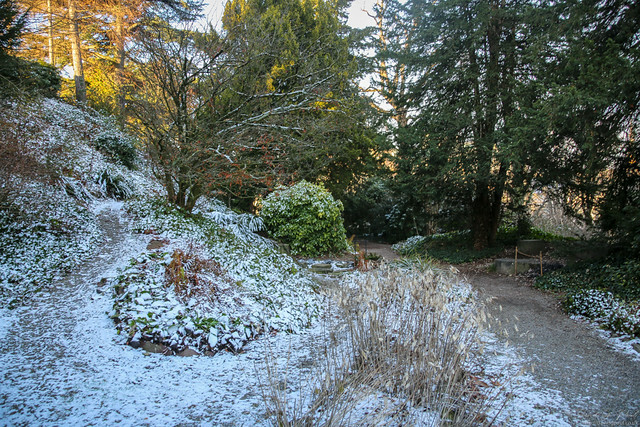 The botanical gardens are located on a hill, but very little was still alive in the winter. The pond was frozen over, and most of the living plants were coated in a dusting of snow. It did give a bit of a view though. Another ten minutes later we arrived at a viewpoint for Lake Zurich - looking back towards the city wasn’t too bad either. There were many swans in the water here, and some of the followed us when we crossed the bridge in the direction of Sechseläutenplatz. On one side of this square is the opera house which seemed worth of a photo - even though it was in the same direction as the sun. It was a case of finding the right place to stand so the sun would be hidden behind the building. 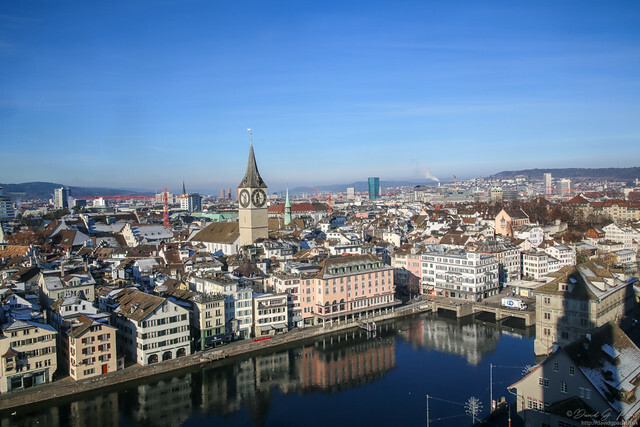 Further along the road we went up some stairs to the Grossmünster​. They do not allow photography inside the church, but for 5 CHF you’re allowed up one the south tower where you can take photographs. This tower has winding stone steps up to a room which then had wooden steps and floors above. The steps here were in far better shape than the ones in Rovinj when I’d been travelling through Croatia. These were very safe. At the eventual top of this tower there are four doors that can be opened - one in each corner. We looked out of each and photographed the view over the city in each direction - which made it worth the price. Back inside the church you can go underneath it as well into the crypt - a large room with two rows of pillars down the middle. On the near side there is also a statue wearing a crown. 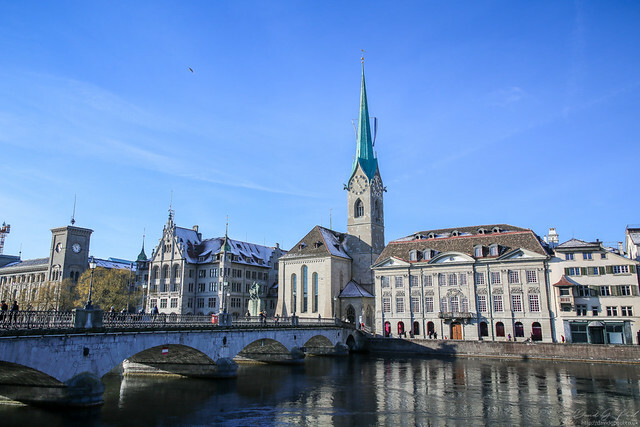 On the other side of the bridge from Grossmünster​ is the Fraumünster​ - which in English is Women’s Minster. This was originally run by an abbetess whose remains were put to rest inside this church. Again, this is another that costs to enter - but at 5 CHF we figured we may as well, even though photography is not allowed. For the best part of an hour we each listened to an audio guide tell us the history of the church and about specific details of its design. Underneath the church is also an archaeological site with ruins of an earlier building. Once we’d done we headed back to the hotel to eat our lunch, and to check-in for the flights we’d have the following day. 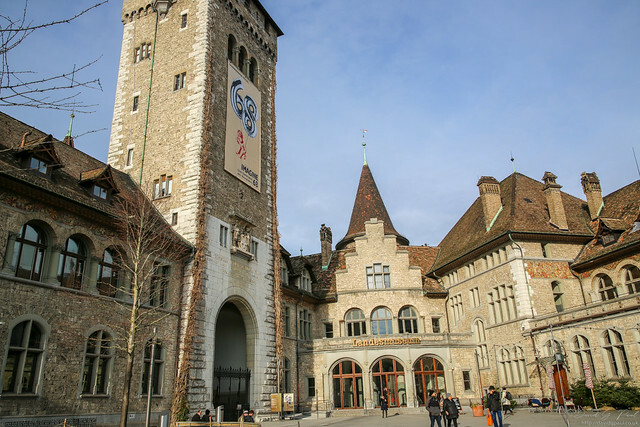 Even though this was a much longer stay than anticipated, we still headed out afterwards to look around the Swiss National Museum. This was a grand building that we’d seen from a distance whilst looking for food the night before. At the time we visited there were five exhibitions on whilst they were doing some work on various parts of the building. The first one we looked around was about the general strike of 1918. This included details about the end of the war, the rise of communism in the east, and some of the troubles it caused. Upstairs from there was another called Imagine 68 - the spectacle of revolution. This one felt more like a modern art gallery than an exhibition so I moved through it pretty quickly. 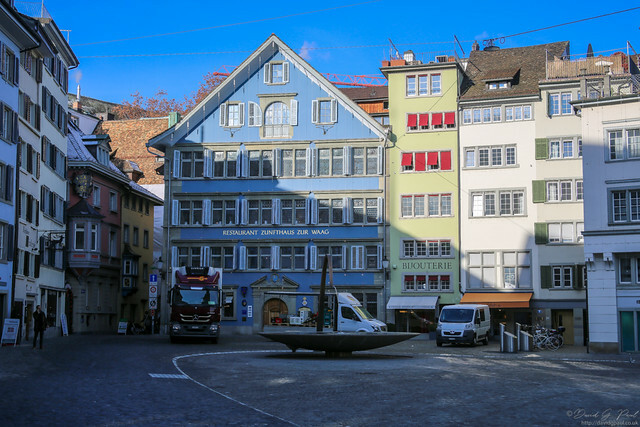 This seemed to being the tour to and end, but after backtracking we found an alternative route that took us to an exhibition on archaeology in Switzerland. This exhibit was more interesting, and more like a museum with various artefacts they’ve found on dig sites. After this the historical theme continued in the ‘History of Switzerland’ exhibition which covered things such as invasions and battles. The final room was about Christmas - so a very seasonal one. This was also another boring one in my opinion. We’d got nothing else to see after this so we were back in the hotel by 16:00. As there was almost an hour until sunset I decided I’d go out for a run. It was cold, but I figured at least it was daylight. By the time I’d gotten out the door, most of that time was passed but at least I’d get to run in daylight, sunset, and the night. To start with I took the long route we’d taken when we first arrived and found this to be one mile. I considered doing loops of this, but decided it’d get boring so I started running across the various bridges and using these to do a loop without crossing a road, and then crossing to do the next loop. The last of these however didn’t have a path on one of the four sides so I found myself running up a hill to a viewpoint. That was okay though as I’d been stopping a few times along the way to get pictures of the sunset. Eventually I found myself back at Lake Zurich alongside the opera house; but this time I kept on going until I’d run far enough to make the return journey up to 8 miles. Unfortunately it wasn’t very well lit otherwise I may have considered going further or faster. 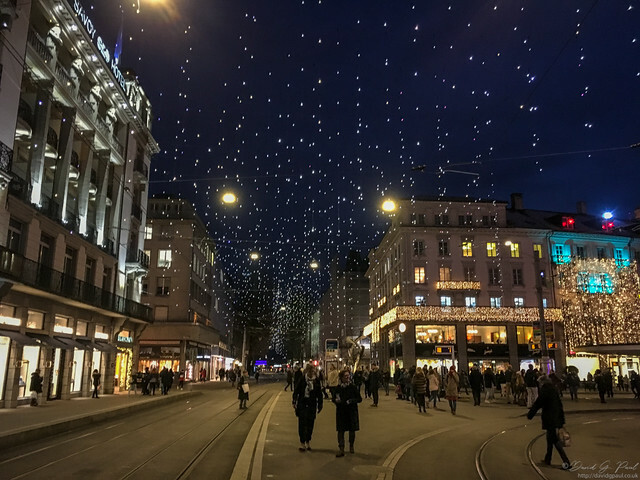 On my way back I passed Christmas lights that were now switched on, and seemed very photogenic - but I also found that the amount of pedestrians had increased tremendously. It seemed over half of them were smoking too. 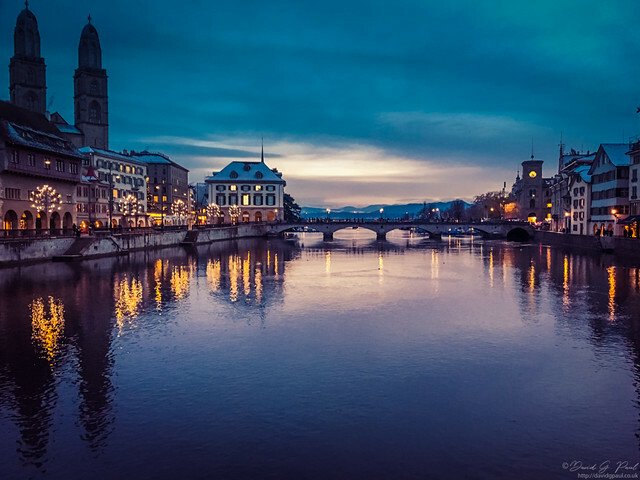 We’d found large parts of Geneva and Zurich seemed to constantly smell of cigarette smoke.